Jane Austen books ranked and reconsidered, from Emma to Persuasion. Here are some of the many things I learned. Also in Slate, Adelle Waldman ranks Jane Austen’s works, as well as her most devastating one-liners. And yet many people whose taste is generally excellent—including, for instance, Slate’s own Ron Rosenbaum and the literary critics William Deresiewicz and Harold Bloom—consider Persuasion Austen’s best book. Tastes may simply differ, of course, but I have a theory: I suspect that some readers prize Persuasion because it is superficially more “serious” than Austen’s other novels. Anne Elliot, at 27, is older than her other heroines, who range from their late teens to their early 20s. Her plight is also the saddest. While Austen’s other protagonists are optimistic about their futures, by the time we meet Anne, she feels that her life has been permanently blighted. Seven years before the novel begins, she broke an engagement to the man she loved on the advice of a trusted friend, and she has pined for him ever since. Her day-to-day life as an unattached woman is dreary. She lives with her unpleasant older sister and her father, a vain, unintelligent man, vulgarly proud of his well-preserved good looks and his baronetcy. Her main solace is tending to the children of her silly, self-involved younger sister. It’s hard not to be a little moved by the barrenness of Anne’s life. Austen herself seemed to be: The mood and setting is autumnal, and the prose is more lyrical than it is in her other novels. The somber tone, the sadness of Anne’s situation—those alone may dispose some readers toward Persuasion. Perhaps even some of Austen’s most fervent admirers are a little embarrassed by her comedies of manners and her books’ supposedly trivial subject matter, the way each one ends with the marriage of its heroine. Perhaps these readers hold up Persuasion, with its older, sadder protagonist, as a counterargument to the charge of frivolity. (Rosenbaum seems to do precisely this.) But Persuasion lacks not only the comic sparkle of Austen’s other novels. It also lacks, relatively speaking, the fineness of observation and the psychological nuance that is enough to make any book—even the fairy-tale-like love story of a teenage girl and a wealthy man—a great one. Austen, who was born in 1775 in a Hampshire village where her father was pastor, never married, and she didn’t publish a novel until she was 35. (That was Sense and Sensibility; she didn’t sign her name to it.) She published three more before she died just six years later; two additional books were published posthumously. These six novels—as well as a few unfinished drafts and scraps of juvenilia—represent the sum of Austen’s output. But by now almost anyone who lives in any culture anywhere probably knows something about her books. They revolve, famously, around courtship. In all six books, there is scarcely a single death. Illness is rare. (The latter appears as a punishment to teach a lesson in Sense and Sensibility and a tool to bring would-be lovers together in Pride and Prejudice, when a sister’s cold throws Elizabeth into Mr. Darcy’s company.) War, poverty, injustice, and existential soul-searching are all outside their scope. Still, it’s an unsubtle reader who conflates a book’s ostensible subject with its depth. (It’s easy to imagine Pride and Prejudice’s sententious, sermon-reading Mr. Collins making that mistake.) It would be like dismissing Shakespeare as a writer of slapstick because his characters regularly cross-dress so convincingly that they aren’t recognized by their own lovers or parents. Proof of artistry is rarely located in plot summaries. Take Emma, in which Austen is at the height of her powers as both an artist and analyst of human beings. The novel has very few obvious signifiers of “seriousness.” It’s the story of a young woman blessed with good looks, wealth, intelligence, and an adoring father; the plot revolves around Emma’s attempts to make matches among her friends and her own mild flirtation with a good-looking charmer. It ends with her marriage. Yet for all its apparent frothiness, Emma is a book about a maturing mind, and it is as devoid of melodrama as a postmodern experiment. At one point, the book even dabbles in stream-of-consciousness, with a wonderful monologue that carries the reader through the arc of a morning’s strawberry-picking expedition while deftly sending up the affectations of its speaker. Emma, Austen tells us on the book’s first page, is in danger of “having her own way rather too much and a disposition to think too well of herself.” (Austen is perfectly willing to tell rather than show.) Nonetheless, she then proceeds to give us the world—Emma’s world, that is—from Emma’s point-of-view, deploying the free, indirect third-person, in which the voice of the character blends with that of the author. We follow Emma as she befriends the hapless Harriet Smith, then breaks up Harriet and her love interest (whom Emma deems unsuitable) and tries to find Harriet a more eligible husband. None of this proceeds according to plan, of course. Emma makes one mistake after another, badly misinterpreting some people and failing to listen to others. And yet she is so clever, so convincing, that, after a while, we begin to see the world as she does. We become complicit in her errors of perception. So when the revelations inevitably occur, it isn’t only Emma who is surprised. We look again—and see the signs that Emma (and we ourselves) misread the first time around—they were there all along. The novel is as well-plotted as a good mystery, but the subject is subtler than that of a whodunit—and the aim is different: It’s not for the pleasure of a dramatic twist that Austen lays her trap; it’s to show us something humbling about our own vulnerability to error and misperception. In initially thinking ourselves superior to Emma, we, too, reveal a disposition to think rather too well of ourselves. Such riffs are not only the most amusing bits in the book, they are also, in an important sense, the most serious: Comedy, when it’s not slapstick, is often moral, a way of showing up what deserves to be shown up. And what gives Sense and Sensibility depth is not the lesson Austen teaches about sense—which could also be learned at Sunday school (though perhaps less enjoyably). It is Austen’s ability to penetrate minds both narrow and lofty, and to examine, with as much sympathy as shrewdness, the ways we justify our prejudices and our small meannesses. That same ability is evident in Pride and Prejudice, a novel that, oddly if not surprisingly, is now beloved for its Cinderella-like love story, one of the least interesting aspects of the book. It’s a remarkably unsentimental novel, and it is consistently intelligent. It is also, like all of Austen’s books, wonderfully brisk. “It is a truth universally acknowledged that a single man in possession of a good fortune must be in want of a wife,” it famously begins. That observation is followed almost immediately with Mrs. Bennet, eager to marry off her daughters, upset that her husband will not visit Mr. Bingley, the single man in question. “You have no compassion on my poor nerves,” she tells him. “You mistake me, my dear,” he replies. “I have a high respect for your nerves. They are my old friends. I have heard you mention them with consideration these twenty years at least.” Austen then gives us a fantastically sharp primer on those two people, describing Mr. Bennet as “a mixture of quick parts, sarcastic humor, reserve, and caprice,” and his wife as a woman of “mean understanding, little information and uncertain temper” whose “solace was visiting and news.” This quick pace—epigrammatic observation followed by witty banter followed by pithy explication—continues nearly uninterrupted throughout the book, which is entirely devoid of filler or flat exposition. Still, Pride and Prejudice is a collection of wonderful characterizations and sharp aphorisms situated adjacent to a delightful romantic plot. It is less deeply unified and, in that way, actually less ambitious than Emma. Or Mansfield Park, for that matter, which, though less perfect than Emma, is perhaps more involving and more powerful. Like Emma, the heroine of Mansfield Park is sometimes hard to like. Unlike Emma, though, Fanny Price is mousy and shy, a poor relation taken in by the Bertrams of Mansfield Park at age 10 in an act of charity conceived of by one of Fanny’s aunts. Raised alongside wealthy older cousins, Fanny is subject to neglect, some benign, some less so. Her situation compels our sympathy, but she is sometimes self-pitying—and, at times, almost dour. Fanny also has a rival, the charming Mary Crawford, of whom Lionel Trilling wrote, “she impersonates the woman she thinks she ought to be.” I actually think Mary Crawford is the bright, bubbly, and worldly person she presents. But I sympathize with Trilling. We all try to find reasons to dislike Mary because we know she is worldly—surely too worldly. She lacks Fanny’s integrity (though we can’t help thinking she’s less of a pill than Fanny). Though Austen is clearly not a big fan of Mary, she is always fair—careful to grant what is admirable and appealing, even in those characters she dislikes. And so, like Edmund Bertram, we fall in love with the pretty Mary Crawford. By her painstaking re-creation of Mary’s talk—her witty paragraph-length discourses on the absurdities of country life, the hypocrisy of the clergy, the abominations of her uncle the admiral—Austen makes us feel for Mary what Edmund feels. She once again makes us complicit. That ability to make us complicit is essential to Austen’s art. A moralist can lecture, but a novelist must create lifelike moments that let us experience the consciousness of another. Austen does this so subtly that it can be easy to take for granted. But we notice when it flags. Northanger Abbey centers on Catherine Morland, a good-natured but naïve heroine whose unworldliness leads her to misinterpret much of what she sees. It is, quite literally, a book about reading, as Catherine’s love of gothic novels plays a role in the story. This is much-discussed among academics, but not particularly interesting to those who aren’t seeking material for scholarly articles. The novel relies heavily on an omniscient narrator, which is telling: While ingenuous Catherine is very likable (confronted with jargon she doesn’t understand, she says, “I cannot speak well enough to be unintelligible”), her point-of-view can’t carry a book. It is too limited to a single note; she’s all youthful ignorance and good-hearted credulity. The omniscient narrator, who frequently interjects and interprets the action of the novel, is here not merely as a device but as a way to compensate for a thinness in the story itself. Austen’s analysis is also less sophisticated. Though Northanger Abbey, like Persuasion, appeared after Austen died, she’d written an initial version before she was 25, which she subsequently revised. At one point, she writes that “a woman … if she have the misfortune of knowing any thing, should conceal it as well as she can”—a biting remark, to be sure, and one that contains some truth about social life (now as well as then). But it is a withering adolescent’s partial truth, exaggerated and cocksure in its cynicism. (In its tone, it is similar to Love and Friendship, the occasionally brilliant but often overdone epistolary novel Austen wrote when she was a teenager. That book, like Northanger Abbey, sends up silly “romantic” conventions like love at first sight and satirizes the kinds of people who make exaggerated professions of feeling.) The wit in Northanger Abbey only appears at first like that which characterizes Austen’s best books. “Mrs. Allen was one of that numerous class of females,” we read, “whose society can raise no other emotion than surprise at there being any men in the world who could like them well enough to marry them.” It sounds at first like classic Austen—that deadpan tone—but here her wit is untempered by sympathy or special insight. 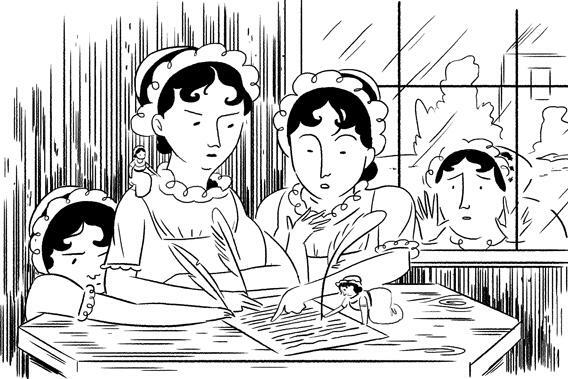 It is that special insight and sympathy—wide-ranging, philosophical and capable of fine distinctions that elude less sensitive writers—that accounts for so much of the greatness of Emma, Mansfield Park, Pride and Prejudice, and Sense and Sensibility. Austen’s plots may not be serious. They don’t have to be, because her mind unquestionably is.